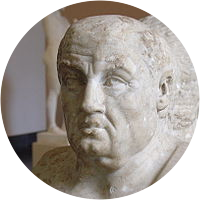 A collection of the best Seneca quotations. Learn how to feel joy. While we teach we learn. Teach the art of living well. Luck never made any man wiser. As the world leads, we follow. This body is not a home, but an inn. Philosophy is the art and law of life. Courage leads starward, fear toward death. A great soul prefers moderation to excess. Noble examples stir us up to noble actions. Who chance often passes by, it finds at last. How rare to find old age and happiness in one! Even after a bad harvest, there must be sowing. The foundation of true joy is in the conscience. Destiny leads the willing, but drags the unwilling. To know how to despise pleasure is itself a pleasure. Vices creep into our hearts under the name of virtues. Pleasure dies at the very moment when it charms us most. Life is most delightful when it is on the downward slope. The stomach begs and clamors, and listens to no precepts. If you stop supporting that crowd, it will support itself. The vulgar bark at men of mark, as dogs bark at strangers. He who would do great things should not attempt them alone. Shut the door on the sun and you will open it to the doctor. A great step towards independence is a good-humored stomach. Fortune dreads the brave, and is only terrible to the coward. I had rather never receive a kindness, than never bestow one. Known to others all too well, they die to themselves unknown. He will be the slave of many masters who is his body's slave. A lesson that is never learned can never be too often taught. No book can be so good as to be profitable when negligently read. The origin of all men is the same and virtue is the only nobility. Philosophy did not find Plato already a noble man, it made him one. Fame does not always light at random: sometimes she chooses her man. Wouldst thou subject all things to thyself? Subject thyself to thy reason. Take away ambition and vanity, and where will be your heroes and patriots? Everything that exceeds the bounds of moderation, has an unstable foundation. It is not the man who has too little who is poor, but the one who craves more. I've been mixing with humanity today and feel the less humane, in consequence. A man who receives a benefit with gratitude repays the first installment on his debt. Human society is like an arch, kept from falling by the mutual pressure of its parts. I do not distinguish by the eye, but by the mind, which is the proper judge of a man. I would so live as if I knew that I received my being only for the benefit of others. The artist finds a greater pleasure in painting than in having completed the picture. Many a man has found the acquisition of wealth only a change, not an end, of miseries. Men are but children, too, though they have gray hairs; they are only of a larger size. Life is like a play! It's not the length, but the excellence of the acting that matters. A hungry people listens not to reason, not cares for justice, nor is bent by any prayers. Many men might have attained to wisdom had they not assumed that they already possessed it. What does reason demand of a man? A very easy thing — to live in accord with his own nature. When we have provided against cold, hunger and thirst, all the rest is but vanity and excess. Unhappy are those men, even though they rule the world, do not consider themselves supremely blest. Freedom can't be bought for nothing. If you hold her precious, you must hold all else of little worth. Ambition [may be] so frenzied that you regard yourself last in the race, if there is anyone in front of you. Our fate is decreed, and things do not happen by chance, but every man's portion of joy or sorrow is predetermined. Nothing is more dishonorable than an old man, heavy with years, who has no other evidence of having lived long except his age. Our plans miscarry because they have no aim. When a man does not know what harbor he is making for, no wind is the right wind. What must be shall be; and that which is a necessity to him that struggles, is little more than a choice to him that is willing. No man can have all he wants, but a man can refrain from wanting what he has not, and cheerfully make the best of a bird in the hand. It is the bounty of nature that we live, but of philosophy, that we live well; which is, in truth, a greater benefit than life itself. As the soil, however rich it may be, cannot be productive without culture, so the mind without cultivation can never produce good fruit. There is the need for someone against which our characters can measure themselves. Without a ruler, you won't make the crooked straight. Men do not care how nobly they live, but only how long, although it is within the reach of everyone to live nobly, but within no man's power to live long. The rule is, we are to give as we would receive, cheerfully, quickly, and without hesitation; for there's no grace in a benefit that sticks to the fingers. Money does all things for reward. Some are pious and honest as long as they thrive upon it, but if the devil himself gives better wages, they soon change their party. Consult your friend on all things, especially on those in which you respect yourself. Their counsel may then be useful where your own self-love might impair your judgment. If you devote your time to study, you will avoid all the irksomeness of this life, nor will you long for the approach of night, being tired of the day; nor will you be a burden to yourself, nor your society insupportable to others. The greatest loss of time is delay and expectation, which depend upon the future. We let go the present, which we have in our power, and look forward to that which depends upon chance, — and so relinquish a certainty for an uncertainty. A man should not fear fortune, for a man counts not only chattels, property, and high office, but even his body, his eyes, his hands, and everything whose use makes life dearer to us, nay, even his very self, to be things whose possession is uncertain; he lives as though he had borrowed them, and is ready to return them cheerfully whenever they are claimed.